Mattie was in love with Billy, but she was too young to wed. When Billy was conscripted to fight in Vietnam, they made a decision that affected their lives and their future. But so much pain resulted that Mattie never really healed. Every turn Mattie made affected her daughter and her granddaughter in ways she didn't even realise. But forty-six years later, is it time for things to be set right?Navy is a young woman who suddenly finds out about her family. But what could be a wonderful opportunity is met with jealousy and apprehension from her cousin, Brooke and her aunt Connie, especially with handsome Aidan around. Each must look past their struggles and find forgiveness and trust, and perhaps even love.This absorbing family drama, set in South Australia's beautiful McLaren Vale wine region, is written by four of Australia's outstanding Christian fiction authors who have brought you best-selling and award-winning novels. South Australian author Meredith Resce has been writing since 1991, with 18 published titles to her credit. Apart from writing, Meredith also takes the opportunity to speak to groups on issues relevant to relationships and emotional and spiritual growth. She was also a co-writer and co-producer in the 2007 feature film production, 'Twin Rivers'. With her husband, Nick, Meredith has worked in ministry since 1983. Meredith and Nick have one daughter and two sons. Rose Dee was born in Ingham, North Queensland, Australia. Her childhood experiences growing up in a small beach community would later provide inspiration for her first novel. Rose, who holds a Bachelor of Arts Degree, decided to try her hand at writing two years ago. The result of that attempt is her first novel, Back to Resolution. Her novels are inspired by the love of her coastal home and desire to produce exciting and contemporary stories of faith for women. Rose�s other releases include Beyond Resolution - the second book in the 'Resolution' series. And A New Resolution � the final book in the series. Rose has also co-written a novel in conjunction with three other outstanding Australian Authors: The Greenfield Legacy. Rose resides in Mackay, North Queensland with her husband, young son, and mischievous pup, Noodle. Paula Vince always wanted to write fiction and love to evoke tears and laughter. Paula lives with her husband and three children in the Adelaide hills, which she uses as the setting for her inspirational novels. She is the author of 7 novels set in Australia. Amanda Deed grew up in the South Eastern Suburbs of Melbourne. Raised in a Christian home, she came to know Jesus at an early age and before the age of 20 was following a passion to serve Him through music and worship, eventually gaining opportunities to tour Australia with a worship band. In 1997, she married Morry and their first child was born in 1999. Soon after that they moved to Darwin for five years, where Amanda served further in music ministry which sometimes took her into remote areas of the country. It was during this period that she discovered a passion for writing and began to seriously pursue it. With three young children, the Deeds have now re-settled in Melbourne's South East where Amanda can focus on her family, her writing and involvement in the local church worship team. Customer Reviews For "The Greenfield Legacy"
I really enjoyed reading The Greenfield Legacy. Set in the picturesque wine region near Adelaide, the story looks at the emotional fallout created as a consequence of decisions made nearly half a century earlier. The Greenfield Legacy explores the complex and fractured relationships between the four main characters. An ensemble story, the plot threads for each of the main characters revolve around a central minor character who is a catalyst for change in all their lives. Maddie, Connie, Brooke and Navy are forced to confront their issues and consider matters of faith and family. We follow each of these characters through the story and witness their character growth as they are challenged by secrets revealed concerning their family heritage. There are flashbacks into the past that gradually reveal the truth behind previous decisions made by each of the characters. This book is unique because it is co-authored by four authors who have each written a plot thread for one of the main characters. Initially I was distracted by wondering who wrote each character, but after a few chapters I became absorbed in the story which flowed smoothly to the end. I had tears in my eyes during a couple of poignant scenes and I found the ending very satisfying. I highly recommend The Greenfield Legacy to those interested in reading Aussie women's fiction and family drama stories with a touch of romance. Four of Australia's Christian authors come together to tell the story of a family - spanning three generations. A legacy has been passed down through the Greenfield family - and not a very good one. It is a legacy of judgementalism and refusal to understand the feelings of others. When a long-lost member of this family re-appears she brings a new hope to the four protagonists of the story. Slowly, a new legacy is built - one of hope. Each author in this collaboration wrote the point of a view of one of the four characters. Each of them had their own supporting cast. This meant that there were a lot of people to keep track of, but as long as you stay alert it's not too bad. This was definitely a character-driven story, and the characters were very compelling, as were the various relationships between them. The whole thing was written as a cohesive whole in a way that can only be considered impressive. In this book, we get not one but four character arcs - each of which comes to a satisfying conclusion. This is an unusual book for two reasons. It has been written by four authors, and it has four main characters. Each character is written by one of the authors, and the four stories are brought together in a skilful way. The story is clever, and clearly shows the impact one foolish decision can have on future generations. A harsh, judgemental father triggers turmoil that disrupts the lives of four women and their families. The story reveals the hardship and bitterness than can occur as a result of unforgiveness and family secrets. It is almost like reading four novellas interwoven to make one story. I found this book difficult to get into as the story jumped back and forward between the characters, and I battled to figure out who the characters were and how they related to one another. Once I discovered the Character List at the end of the book, I found it easier to follow. As the characters developed in my mind, I began to relax and enjoy the story. Being from South Africa, I appreciated the Australian descriptions and context, and I wondered how often the same story occurs undiscovered in our own country. I would definitely recommend this book for an intriguing read, although I would like readers to know about the Character List before they started reading. Thank you ladies for a brave idea cleverly implemented. Thanks to Rose Dee for my copy of this book. I did enjoy this book and found it interesting with 4 different main characters that are all from the one family. We have Mattie the Matriarch of the family and we find out in Chapter one she gave up a child for adoption. The story then revolves round this issue and how it affected the various members. We have Connie who is Mattie's Daughter and Brooke her daughter. We also meet Navy Who is also related. Each character is written by a different author and there is a contest to work out who wrote which character, while this is a fun contest I did find at times it distracted me as I was trying to work out who wrote what part. I would personally have rather known who wrote what part and not be thinking about who wrote who. The book is like a novella in many ways except its happening at the same time. We go from one character to another and see the story through different eyes. While I really enjoyed the story and the more I got into it the more I loved it I did have one issue with the early part. There are a couple of instances of swearing which shocked me and I thought were totally unnecessary. I honestly don't expect bad language in a christian book and was disappointed. It wasn't enough for me to put the book down as it was early one and only 2 or 3 times (and one was more cussing which others may not be offended by). I say this just as a warning to some of my friends who also do not like bad language. being forewarned is a help. It is this reason I can not give the book 5 stars but it is a 4 - 4.5 star book in my view. 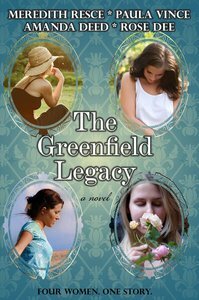 Meredith Resce, Paula Vince, Amanda Deed and Rose Dee's novel The Greenfield Legacy is a wonderful family drama that will warm your heart, giving you mixed emotions about each of the characters, allowing you to grow alongside them, as well as helping you appreciate your own family. I must admit that at the beginning, my expectations weren't that high. However upon finishing the novel, I was pleasantly surprised. I believe that the aspect of having the four women tell the story was a good idea because it allowed the story to have an added dimension, that wouldn't have been available, had it have been written differently. Another aspect that I really loved about this book, were the unexpected twists the authors incorporated within the story. Just when I thought I had the story all figured out, another twist is revealed, adding excitement and depth to the story. I also love the character development in this story, because the reader really gets the family feel. Each character is somewhat similar in their personality, but yet different at the same time with their needs and aspirations, just like how it is in reality. Each character will definitely find a place in your heart, be it positive or negative, sympathy or frustration. However that said, I personally believe that a little more character development and intimacy between Brook and Aidan, Navy and Matt would've really engaged the reader a bit more, making them feel like these characters really belong together. Lastly, I believe this book has a lot to teach about families' struggles and the need to forgive one another because it shows how bitterness and unforgiveness can be passed through generations preventing a happy filled life. Overall, I believe that this book is one that will easily be enjoyed by all and one that will definitely teach you things about family life. It is a wonderful, easy going family drama that can't be missed for it will touch your heart.